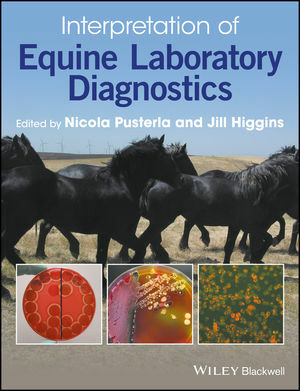 Interpretation of Equine Laboratory Diagnostics offers a comprehensive approach to equine laboratory diagnostics, including hematology, clinical chemistry, serology, body fluid analysis, microbiology, clinical parasitology, endocrinology, immunology, and molecular diagnostics. Nicola Pusterla, PhD, Diplomate ACVIM, is Professor of Equine Internal Medicine in the Department of Medicine and Epidemiology at the University of California at Davis School of Veterinary Medicine in Davis, California, USA. Jill Higgins, DVM, is a Private Equine Practitioner/Consultant at Equine Consulting Services in Penryn, California, USA.